Blackinton B297 Eagle Badge - B297 - 1 5/8" x 1 1/8"
Home > Blackinton > Police Badges > Badges with Eagles > B297 Eagle Badge - B297 - 1 5/8" x 1 1/8"
B297 Eagle Badge - B297 - 1 5/8" x 1 1/8"
This Sturdy Blackinton badge, a made to last item from a manufacturer famous for quality, is the first choice for law enforcement officers and anyone else working in an official capacity. 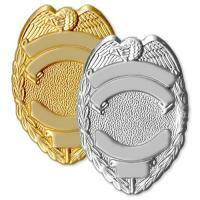 The eagle shield measures 1 5/8" x 1 1/8" and is available in either gold or silver cast metal. Style #B297 with its three panels and adequate center space can be customized with lettering and a seal to fit your exact needs. You will wear this item proudly knowing that it was manufactured with pride right here in the United States of America! Dimensions: 1 5/8" x 1 1/8"
©2002-2019 CopsPlus.com: Blackinton B297 Eagle Badge - B297 - 1 5/8" x 1 1/8"